OK, I just hafta give a shout out to Gibson Guitar Corp for their overall guitar news and lifestyle website. You've got it all - band and guitar news stories, feature articles, lessons for guitar and bass players, artist and event profiles and even free MP3 downloads. You have access to basic, intermediate and advanced guitar tutorials and videos. You have reviews of albums and articles about current events as well as days gone by. I even saw a special interest article about a KISS tribute band made up of "little people", complete with a video of their performance on the Jimmy Kimmel Show. You just can't make this stuff up! You can get your fix of guitar news in your email box or as an RSS feed right here! Have an interest in more than just guitars? Check out my friends and sponsors, Audiofanzine. Not only can you get the latest guitar news, you have access to reviews, tutorials, videos and more. Want to know about the latest studio and stage equipment, computer recording software or video gear? Audiofanzine has it here. There is a constant flow of information available, with dozens of articles and reviews added daily. The user community is very active and friendly, so you don't have to be bashful with your questions. Sign up for a free membership and get access to all their resources. Contribute a review of your favorite gear. Got a question? Ask it in their forums. Got some gear you've outgrown? Place an advertisement in their Classifieds. There's a ton of stuff offered up by the good folks at Audiofanzine. 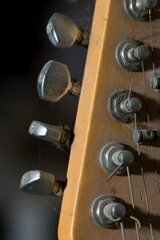 Another great resource for news, reviews, interviews, tabs and lessons is Ultimate-Guitar.com. They've got so many songs tabbed there you're bound to find something to keep you happy. Readers are able to sign up and contribute tabs and articles they've written. There's also an online community to share your questions and comments. Ultimate-Guitar.com really is an all-encompassing guitar website. You could end up spending all your time there and not practicing with all the stuff going on. You can search the tabs and other features of the site here at Ultimate-Guitar.Com with over 100,000 guitar, bass and guitar pro tabs. Something to keep in mind: tabs are submitted by amateurs and pros, so when you're reading and playing them, if they don't seem right to you, no big deal. Check out another version - maybe it's more in line with what you're hearing in the tune. Guess what? You can submit your tab version, too. There's lots of tabbing tools available, but it takes skill, time and effort to write them. Anyone that does it and shares, my hat's off to 'em!